a lot has been going on around here lately, and it's been accompanied by this pseudo-spring. it isn't officially spring until tomorrow, and yet it's felt as if it's been here for weeks. at the last minute (more my way than J's, but it worked for the both of us this time), we booked a ski trip to Utah. we joined two of E's buddies and one of ours, and had a great time, save a mini-cold the boy developed. prior to our trip, we stayed at the renaissance in atlanta to see the airplanes... it's not a stretch to say that experience is in the running for the best part of the trip. :) it was unseasonably warm, but the snow was right. we skied well (with locals guiding our way! ), ate a few good meals, and loved our hotel... but at the end of the day, were so happy to be home. man, I love this place. since returning home, J has been hard at work planting trees. I've floundered between feeling overwhelmed at all this free time I have, and amazed at the amount of work there is to be done. yesterday, a beautiful sunday, J and I started a project together. (to me, that is the best kind.) since the bricks in our driveway need to be moved before landscaping begins, and my love-affair with bricks means I want to save them, we maddox-ed the bricks out of the ground, loaded them onto the golf cart / bobcat, and started a stack at the edge of the woods. I'm so excited to have access to these old, heavy clay bricks for future projects. and speaking of these projects, my first manifested itself yesterday when I created a brick path between our two raised beds. it's more work that it looks... but also completely doable, even for the first-timer I am. J got me started by leveling the ground with a shovel and dumping white sand on top, but it was all me from there. 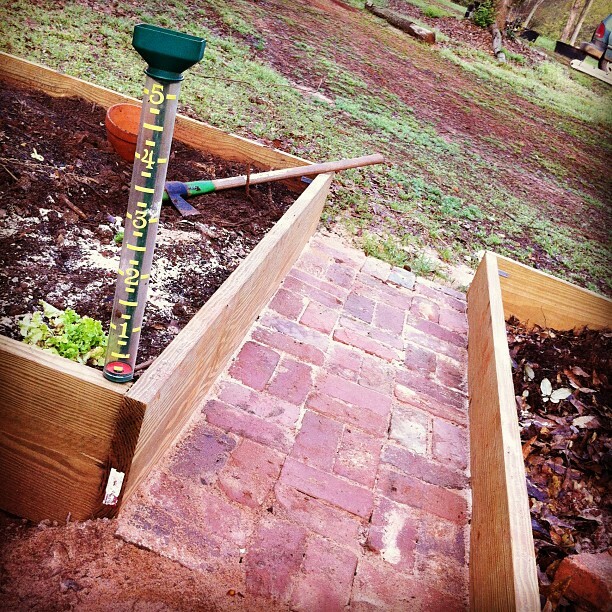 the men now have the idea to continue the brick / raised beds / terracing theme throughout our garden. I say: yes, yes, and yes. a project that I can own, and also one that is different from other yards. on the Eastern side of the house, a Daphne. are you familiar with it? if not, find one and smell it. you'll fall in love. my mom gave me the plant, and I'm excited to start it as a baby and watch it grow over the years. "let's take a picture so we can show our children what this formerly looked like. nothing is here, but it will be covered eventually," J said. to me, one of the best parts of this life we're living is having the opportunity, resources and encouragement to do things yourself. to repurpose items. to dream up projects and make them happen. to plant your own seeds and then transplant them outside ... then eat their fruit all summer long. (and winter, too, when we can.) to love and give and make our own happiness. to cut down on the materialism and make things. make happiness. make love.